that the school was embarking on this project and, given the clubâs commitment to encouraging reading among our nationâs youth, the club put together a collection of books ranging from novels, textbooks, as well as other reference publications. 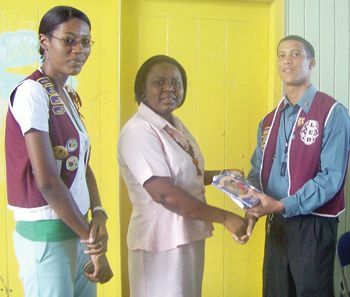 Latchman accepted the books on the schoolâs behalf and envisaged that the Library would go a long way in enhancing reading, motivating the students as readers, and eventually ensuring that the students gain higher standards generally and academically. The Leo club also engages in its monthly Feeding of the Homeless activity, which targets homeless citizens on the streets of Kingstown. They were served with a corned beef or cheese sandwich, along with a cup of hot chocolate. The most current having been completed last Saturday, February 21, 2009.